This quarter, students will be reintroduced to Art Elements, with a special focus on the elements of Line and Value. In Art History, students will learn about the Italian Renaissance and the changes in thought and art produced during that period in time. Students will learn about the concepts of study drawing, and linear perspective. Projects to be completed during first quarter include the Rembrandt Elephant Study Reproduction and Linear Perspective Landscape. This quarter, students will focus on the Art Elements of Form and Texture. We will continue to study the Renaissance and different art forms that flourished during this time, with an emphasis on tapestry and sculpture. Students will study tapestries and their different properties and learn about how elements such as composition, narrative and texture work in this art form. Project to be completed during the second quarter is the Unicorn in Captivity Tapestry project. This quarter, students will focus on the art elements of color and value, looking to artwork in the late and Northern Renaissance to see these elements at work. We will study the work of Albrecht Durer and discuss the advantages and disadvantages of using multiple different mediums. Students will learn about woodcut prints and their historical significance. Project to be completed during the third quarter is the Wood Cut Print Project. This quarter, students will continue to study the work of Albrecht Durer. We will discuss how Durer was part of the Norther Renaissance, and how his work was different from participants in the Italian Renaissance. We will discuss Durer’s hyper realistic drawings and paintings of animals and work to create a reproduction of one of his masterpieces. Project to be completed during the fourth quarter is the reproduction of Durer’s Wing of a Blue Roller. This quarter, students will be reintroduced to the elements of art that will be studied this academic year; their study of art history will focus on European art in the Middle Ages. Students will learn about the art form of the portraiture and self-portraiture this quarter, while focusing on the art elements of line and color. They will also study the Western tradition of Illuminated manuscripts and learn about how the art elements of pattern and color are used to express significance in these works. Projects to be completed this quarter are Self Portrait Projects and Illuminated Manuscripts. In Quarter Two, students will learn about Gothic Architecture and juxtapose that artistic movement with the tradition of Islamic art. Students will focus on the art elements of color and texture and observe the differences and similarities of how these are used in each artistic practice. There will also be a focus on both Gothic and Islamic architecture this quarter. Projects to be completed this quarter are the composite Rose Window project and Islamic Tesselation project. In Quarter Three, curriculum will focus on Early/Medieval African Art and Chinese Art. This quarter, students will focus on the different ways the art elements of texture and form are used in art work from different parts of the world. Students will discuss how available materials shape the style and execution of native artwork. They will discuss how different styles in artwork express important information about the culture from which they come. Projects to be completed this quarter are African Masks and Chinese Ink wash paintings. This quarter, students will focus on the art elements of color and form. They will focus on the history of Native American artwork and learn about its different styles and its influence on Arizonan culture and aesthetic today. They will learn about the importance of symbols in Native American Art as well. Students will also discuss and observe classic American architecture and portraiture and how it was influenced by ancient Roman art traditions. Projects to be completed this quarter are Native American Pottery project and American Architecture Project. This quarter students will be reintroduced to elements of art and will focus on art elements of light and space/perspective. Students will look at different ways light can work in a piece of art and will practice using value to create the illusion of light and form themselves. Students will also learn about the different compositional areas in an art work that help create the illusion of. Students will also learn about Byzantine mosaics and work to create their own sample of this practical and beautiful art. Projects to be completed this quarter are Light Still Life project and Mosaic project. This quarter, students will focus on the art elements of pattern and color and study how they are applied in textiles and fine works of art. They will observe the use of pattern in textiles and practice it themselves. They will look at classic American quilting patterns and discuss how they can be used to create a functional work of art that tells a story. They will also learn about the art element of form and how it can be real or implied. They will explore this element by looking at the art of Wayne Thiebaud. Projects to be completed this quarter are the Quilt Pattern Project and Wayne Thiebaud Desserts. This quarter, students will study Native American Artwork with a focus on stylized pattern in Native American textiles. They will learn about the process of making these useful works of art and how the materials available to the makers influenced what they created. Project to be completed this quarter is Navajo Blanket project. This quarter, students will learn about the artist Mary Cassat, her portraiture, and how she worked to pursue her dream of being an artist. They will also learn about the artist Edvard Munch and how he tried to communicate feelings through his Expressionist art work. Students will focus on the art elements of color and texture this quarter. Projects to be completed this quarter are Mary Cassat Project and Munch’s Scream Project. This quarter, students will be reintroduced to the art elements, with a focus on line and perspective. They will begin by studying how line can be used in artwork by observing simple line drawings and more complex works by Pablo Picasso. Students will also study Japanese prints, with an emphasis on the artist Hokusai, and observe/discuss how he uses size to create the illusion of distance in his work. Projects to be completed this quarter are the Picasso Rooster reproduction and Hokusai’s Great Wave watercolor project. This quarter, students will focus on the art elements of form and texture, and will discuss the particular art form of landscape. Students will learn about the tradition of landscape painting and how it developed from highly realistic representation to the impressionistic expression of Van Gogh. We will talk about how texture in painting and drawing can also communicate the illusion of movement. Project to be completed this quarter is Van Gogh Starry Night pastel project . This quarter, students will go over the concept of abstract art and compare it to realism in art. They will learn how to differentiate between these two artistic styles by looking at examples of both realistic and abstract art by Durer and Picasso, who both often used animals as a subject for their artwork. Students will also talk about the advent and popularization of abstract art in history and look at works by Kandinsky and Paul Klee. Elements of art in focus will be color and composition. Projects to be completed this quarter are Durer Hare project and Klee’s Cat and Bird chalk pastel reproduction. The quarter, students will continue to study abstract art and will learn about how some artists marry the two traditions of representational art and abstract art to create semi abstract works; they will focus on works by Paul Klee, Wassily Kandinsky and Marc Chagall and practice using the art elements of color and perspective. Projects to be completed this quarter are Marc Chagall pastel project and Paul Klee Old Man Portrait. Curious to Know What Your Students Are Learning This Year? Then take a peek at the the Scope and Sequences following this post! Please keep in mind that these lists are subject to change as the year progresses. If you have any questions regarding the information provided, please don't hesitate to email me! Art clubs are filling up fast, so head over to Configio before slots are full! 2-3 Grade Art Club will be traveling the world this year, exploring art styles from around the globe. Clubs will be held in the art room from 3:10-4:05 on Tuesday afternoons. 4-5 Grade Art Club will be exploring the more tactile practical arts, such as stamps and bookmaking. Clubs will be held in the art room from 3:10-4:05 on Thursday afternoons. If you have any questions, please feel free to email me at carce-lindsay@archwayarete.org or Mr. Naaktgeboren at mnaaktgeboren@archwayarete.org. I am so excited to welcome you, whether you be new or returning, to Archway Arete as the academic year begins. I hope you have enjoyed your summer and are refreshed and ready for a new year of learning! My name is Ms. Arce-Lindsay, and I will be teaching art for 2nd-5th grade. This will be my fourth year working as a Visual Arts teacher for Great Hearts Academies. I received a degree in Studio Arts from Biola University, and graduated from the Torrey Honors Institute, a program which specializes in Socratic dialogue centered around classic works of literature, poetry, theology and philosophy. Additionally, I have been working with children in an academic setting for over six years. These qualifications uniquely outfit me to teach your children about art and to help them see the goodness, truth and beauty in it as well! Fine art, especially the visual arts, is a great passion of mine. I am so excited to have the opportunity to share that passion with your students. This year, we will delve into great works of art as we learn how to view them in the light of their historical context. We will learn how to identify the various elements of art used in these works, and how to interact with them with wonder and reason. This year, I hope to see students continue to expand their visual vocabulary and curiosity, and flourish in their creativity. If you have any questions, whether it be about curriculum, class, or even if you would like to know if there are ways you can help, please feel free to contact me. I will be updating my blog once a month with updates about each class’s progress, and if you have any questions in particular, please feel free to email me. I have great hopes for this class, and I am eager to work with you to make it a success for you and your students. Here’s to a fantastic year! This famous Van Gogh painting is one of my favorites. This image is actually one of many in a series that Van Gogh completed in order to decorate his studio. He wanted to make it more welcoming for his friend, Paul Gauguin, who was to stay with him. 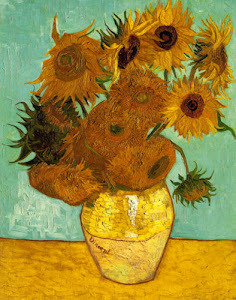 The thick impasto application of the paint on the sunflowers makes them look full bodied and heavy-headed, as though the flowers could lean out of the painting at you!